We have discussed Oklahoma Horse Online and really like the site. If you are trying to find a trail ride, there is a calendar of events that has a lot of upcoming Oklahoma trail rides across the state. It is a really convenient way for you to locate rides that fit your schedule. At the end of a long day, it’s hard to tell who is more tired; the dog or the horse. Long days and wet blankets make well broke horses. These guys had a good day, but they’ ll sleep well tonight! We aren’t ” tune up ” specialists. Here at the ranch, we develop special horses for those special folks that appreciate what we do and more importantly what we don’t. We aren’t in the business of trading horses. We don’t pick up horses at the sale, ” tune them up ” and put them on the market. The horses at our ranch just south of Tulsa, Oklahoma enter a two-year rigorous education that makes them ready for all kinds of activities. These horses have seen lots of wet blankets and been exposed to hard work. In the horse world you usually get what you pay for. If you want one of those ” tune up specials ” you will definitely pay a little less for the purchase price, but will probably pay for it later. Pete shown above is approximately 14 months thru his schooling. The training logs show everything he has done and what he has accomplished so far. Quarter horses like Pete are hard to find. Sound, gentle, easy to catch, ready to ride, Pete is willing to try almost anything and quick enough to make a competitive amateur reining horse. The athletic ability combined with his good mind plus the two-years of training at the end of the program will make Pete a hit anywhere. Keep your eye on Pete as he finishes his education. 3. A running martingale may be used with a snaffle bit only. We aren’t show people and don’t really claim to be, but the rules make a whole lot of sense. If you have a well-trained horse, you shouldn’t need a lot of these things. A properly trained horse will present without having to use harsh mechanical gear or unnecessary force. The new rules appear to help level the playing field so good trainers can do their job and not have to compete with those who want to take short cuts rather than spend the time required to do the job right. 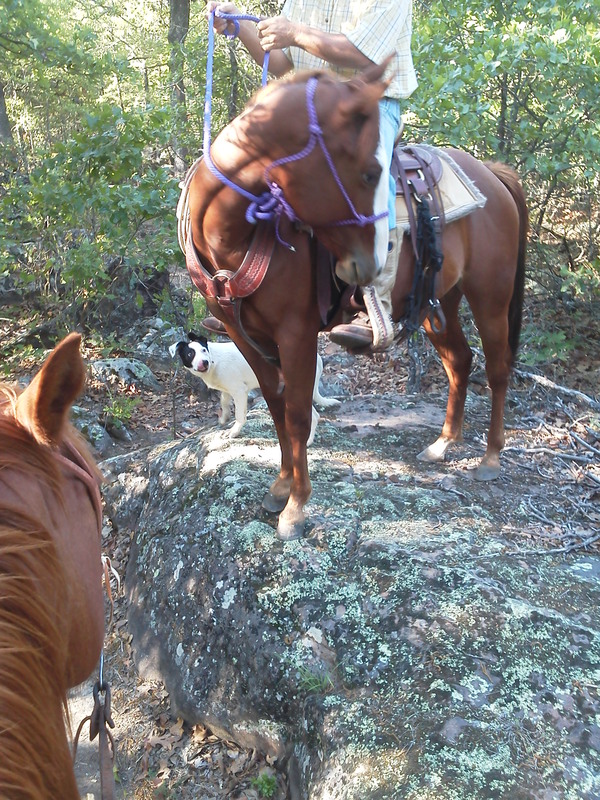 Sometimes a horse with a few quickly identified fears makes you the best trail horse. It sounds a little strange to some people, but a horse whose fears you overcome will gain trust and confidence in his rider. 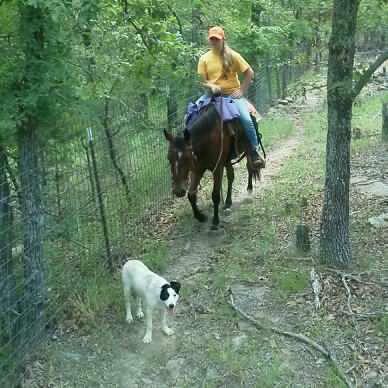 Since we have horses for sale in Oklahoma that are intended for serious trail riders, we like for our customers to understand a few of the things we have learned over the years. Experience has taught us a new horse with some small fears often turns into an excellent trail horse. You may say that goes against common sense, don’t you want a horse that is always calm and unafraid? Not us! As we have said and will continue to repeat, every horse is afraid of something. The horse that is never concerned about anything will be the horse that one day blows up over an oak leaf falling on his neck or some other equally silly event. We believe in horses that have learned to handle their fears and deal with unexpected situations. Each to his own, but riding a horse that knows what to do when scared is far safer than a horse who just hasn’t been exposed to what is going to set him off. Give it a little thought and see if you agree. Dr. Chris Skelly of the University of Michigan says ” As a young “horse crazy” kid, I dreamed of owning my own horse. Guided by my 4-H leader, I was fortunate when my family purchased Bluebonnet, a 7 year old grade mare that was previously owned and shown by a 4-H family. ‘ Blue ‘ taught me the ropes of horse ownership and provided years of learning and enjoyment . . . [a]fter working with horse enthusiasts and university students for over 15 years, I have a much better appreciation for buying the right horse that suites a prospective owner’s needs, and the pitfalls and heartaches that can take place when a mismatch occurs. New horse riders don’t always see how the right horse for their own needs makes all the difference. Not just size, but temperament, personality, athletic ability, and intended use. A horse suited for you and what you want to do will go along way to your enjoyment and success. Bits are always a fun source of discussion. Experts abound and everyone has an opinion. The KISS approach seems to apply to bits better than any other principle. YOU KNOW, Keep It Simple Stupid! Grazing bits are fairly gentle and perfect for a beginning rider who may occassionally jerk a little too hard. These simple bits are all you need for a well broke horse. You train a horse’s mind, not his mouth. Bits are intended to help you communicate. Sure bits give you a feeling of being in control, but we promise you it is only the “feeling of control. ” People who think the problem with their horse is the wrong bit are simply in error. A well broke horse can generally be ridden in nearly anything, hackamore, snaffle, grazing, or just a halter. We don’t recommend riding in a halter unless you know what you are doing, but our horses are regularly ridden in a simple rope halter. In fact, the bridle is often slipped off the head and the horse ridden with just the reins to see how they do. Again we don’t recommend this exercise to others, but it lets us evaluate the training level reached. Bits are merely tools and most folks need a simple tool that lets the rider and the horse communicate two essential commands; stop and turn. The key to bits is good communication and training, not force. If you have to make your horse stop by sheer strength, something isn’t right. Ever see these guys with the big arms that reach forward, grab up the reins, and sit way back in the saddle pulling as hard as they can while yelling ” WHOA! ” You shouldn’t have to do that! Nor should you have draconian bits that look like they’ll make a hole in the roof of the horse’s mouth. If your horse won’t do what you need in a grazing bit, then your horse isn’t well-trained. The Oklahoma quarter horses for sale here will work all day long in a simple grazing bit and give you an honest day’s work. Pete is really coming along nice. Notice the loose rein and the way the reins loop down. 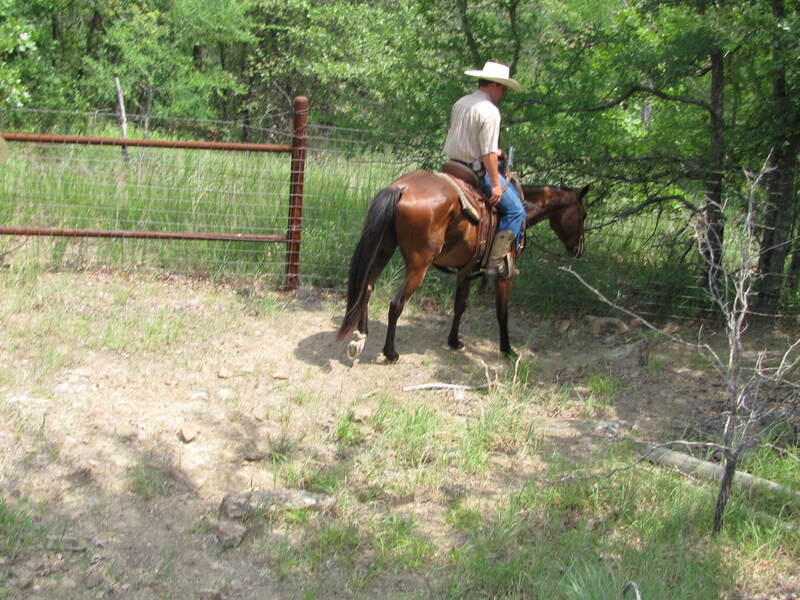 Any trail horse for sale in our Bixby, Oklahoma operation will ride loose rein. 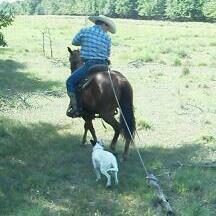 We often see folks going down the trail pulling back and fighting their horse to maintain control. It doesn’t have to be that way. Pete will go all day with his head down on a loose rein crossing logs, water, bridges, surrounded by barking dogs, and never flinch. He neck reins wonderfully and handles well with anyone on him. 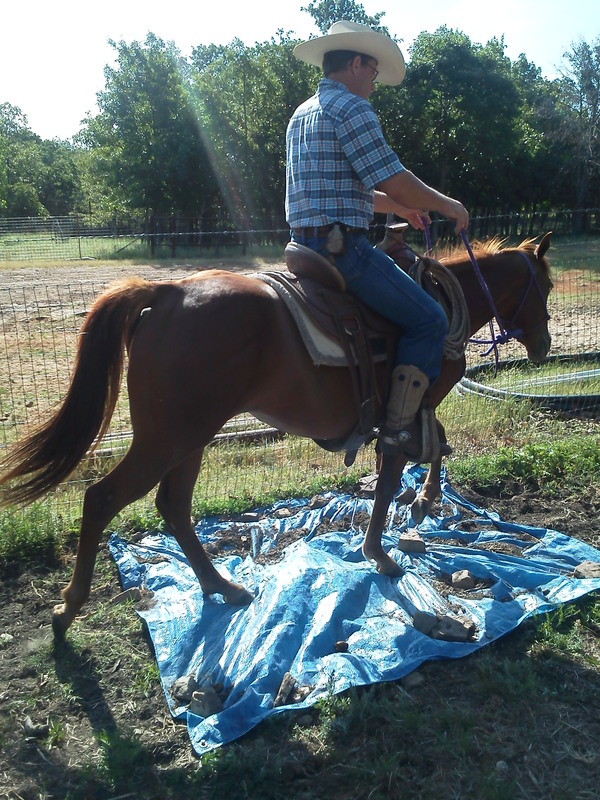 Here he is ridden by our Summer intern enrolled in Oklahoma State University’s Animal Sciences program. A future young vet in the making along with a great trail horse. That’s a combination tough to beat! This is Montana learning to neck rein. She is a young filly we started a few months back. Notice the headstall is a halter, not a bridle. Montana has those natural genetics of a good quarter horse. She is sound and generally doesn’t get excited. There isn’t any concern she is going to take off or act silly. Her mother, Suzie, is another one of those quiet, easy-going trail horses. Using the halter instead of a snaffle saves her mouth while she learns to neck rein. Here the rein on the right side is lightly touching her neck while the left rein is being used to gently pull her nose around. Put in a little forward motion and you have a turn. Riding in halter during training means when she finishes the program and is finally one of our horses for sale that we can offer her to people with the expectation that she will respond well for customers using a simple bridle. Like a lot of trainers, we give our future trail horses for sale at the end of our two-year training program practice going over tarps on the ground. Here Speck is going back and forth over the tarp and doing a few drills with the tarp mixed into the exercises. The tarp doesn’t have to be real big, just something that makes noise and feels unusual to the horse’s feet. These types of drills are used sporadically along with lots of long rides on the trails to build confidence. Dragging logs is part of the training every horse in the program receives. It benefits young horses in a number of ways. Physically the horse develops because he is using muscles differently than just riding. But the increase in muscle size and strength is not the primary reason we drag logs. The horses learn to work and start to appreciate having a job. A smart horse can see you doing something. He won’t understand what you are doing, but can sense you are engaged in a task that has a meaning. 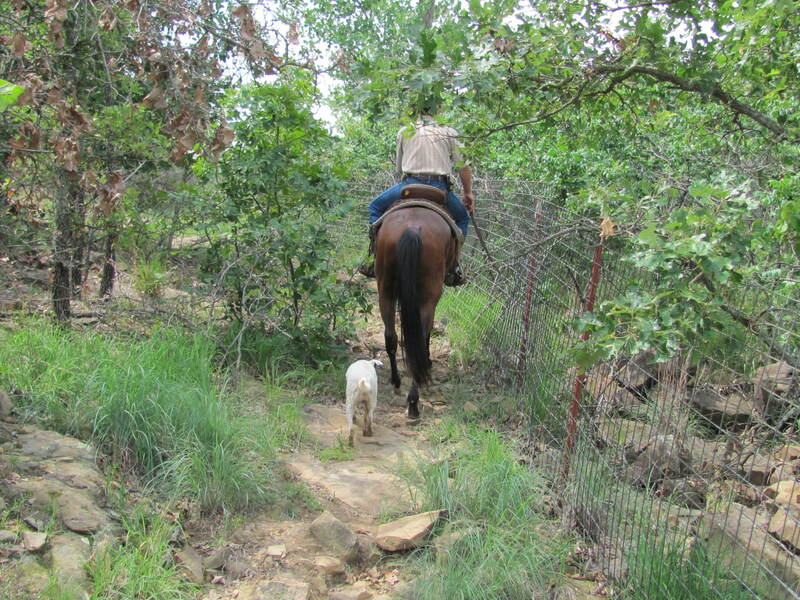 Clearing trails is a function regularly done by a lot of trail riding groups and horses are used for the heavy work. We start the young horses with light logs to develop confidence and get used to the log sticking and catching on rocks, dirt, and other obstacles. It also get the horses used to a rope around their legs, tail, and even neck when backing. The constantly changing positions of the logs require the horses to balance and maintain their feet under their body. They also learn not to fear ” creatures ” running up from behind. There are numerous reasons to pull logs, fence posts, and other things for developing good trail horses. We want all of our trail horses for sale to know how to work. Log dragging is good for the mind and the body. Besides it sure beats us moving stuff around the ranch by hand! You are currently browsing the horsesfortrail blog archives for September, 2012.